This video proves that the new 2019 Dominar is mechanically different than the old / existing Dominar. Hat tip to Youtuber the Storm rider for sharing the exclusive video. Bajaj Auto Limited is all set to launch the new 2019 Dominar 400 in India. The bike has already entered production at company plant, and has also featured in the official brand film of 2019. As per dealers, launch will take place in a few days. Some dealers have already started accepting booking amount. Leaked spy shots and videos confirmed what are the changes on board the new Dominar. Visual updates include all LED headlamp which is same as old Dominar, a large radiator for better cooling, tank mounted digital display offering information on time, gear position, odometer, trip distance and fuel consumption. It also receives increased ground clearance as compared to that seen on its current counterpart – thanks to new exhaust system. Other vital updates include USD front forks as against telescopic front forks seen on the earlier model. The 2019 Dominar however, continues to sport multi step adjustable mono shock unit at the rear. A new exhaust system with twin canister and integrated catalytic converter was also evident on the model on test while new rear view mirror, new leg guard and steel braided brake cables were also noted. There was no official word on what are the changes done to the engine. Is it more powerful? Does it deliver better top speed? Well there was no way that this could have been proved, unless Bajaj officially confirmed. But, now there is a video, which confirms that 2019 Dominar will have a higher top speed as compared to the old Dominar, and this has been recorded on a video. 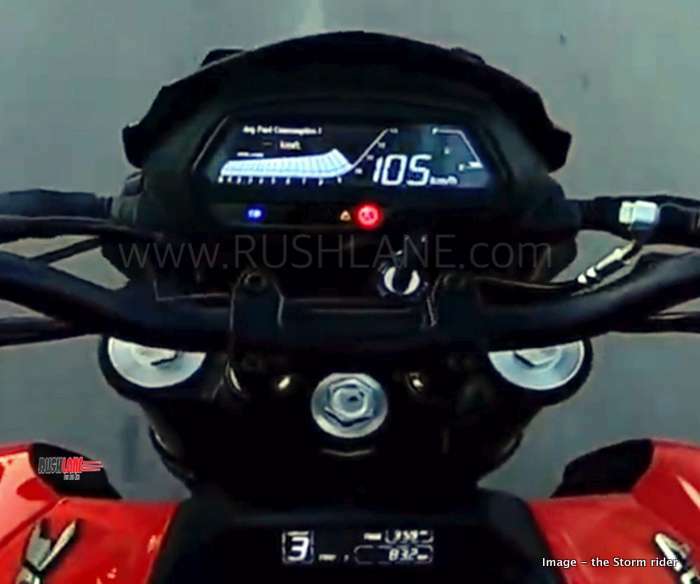 Thanks to Youtuber the Storm rider, who has managed to ride the 2019 Bajaj Dominar, and record its top speed in 1st, 2nd and 3rd gear. As per the video, he has managed to get 57 kmph in 1st gear, 81 kmph in 2nd gear, 106 kmph in 3rd gear. This numbers when compared with current Dominar, stand at 49 kmph, 71 kmph and 92 kmph respectively. It is also to be noted that the 2019 Dominar was tested in Leh, Ladakh, which is at a higher altitude (lesser oxygen) as compared to where the old Dominar was tested. Engine specifications on existing Bajaj Dominar are 373.3cc, triple spark, SOHC, 4 valve, DTS-i, liquid cooled, fuel injected engine. It makes 35 PS power at 8,000 rpm and 35 Nm torque at 6,500 rpm via a 6 speed gearbox. In the 2019 Dominar, you can see that the rider is able to pull the machine till 10,000 rpm (confirms rpm limiter has been set to higher rpm). Also, vibrations are lesser, thanks to DOHC setup. New engine is BS6 compliant as well. 2019 Dominar will command a higher price tag in the range of Rs 1.8-2 lakhs, ex-sh.